Automatic heavy duty tape dispenser IWM-06 for insulation tape and coil taping. - pre-cut tape is presented at the front of the machine. An opto-sensor detects tape removal, and immediately dispenses and cuts (to pre programmed length) fresh tape ready for use. The IWM-06 is a heavy-duty, microprocessor controlled machine that automatically cuts and dispenses preset lengths of tape and presents them to an operator ready for use in manufacturing or packaging processes. The machine is designed to dispense adhesive tapes, packaging tapes, insulation tapes, cloth and nonwoven tapes of all types. 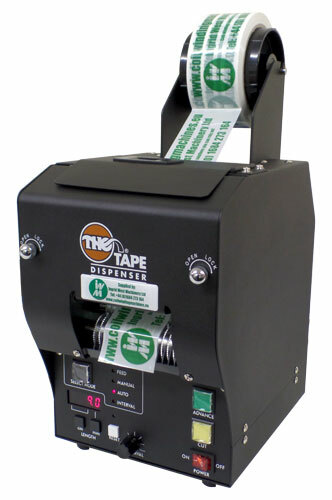 This tape dispensing machine is ideal for wide tapes up to 80mm.